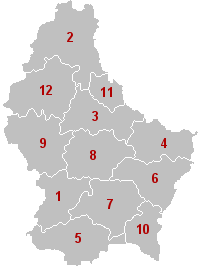 The 12 cantons (French: cantons, German: Kantone, Luxembourgish: Kantonen) of the Grand Duchy of Luxembourg are areas of local government. They are subdivisions of the three districts of Luxembourg. The cantons are in turn subdivided into 106 communes. The cantons were created, together with the districts, on 24 February 1843. Cantons of Luxembourg Facts for Kids. Kiddle Encyclopedia.